After becoming enamored with L'Atelier, New York, I knew it was only a matter of time before visiting Joël Robuchon's Paris location. At first I was concerned that the menus would be too similar. And they were similar; but as it turns out, L'Atelier had quite a few different dishes and, of the dishes that were repeats, there were slight modifications. One of the courses I sampled during my last visit, La Langoustine, is currently my favorite dish in Paris. But while there were extreme highs, there were also quite a few lows, making my overall experience here positive; but, not quite so impressive as chef Suga's work in New York. Unlike in New York, L'Atelier Paris has no table seating: only two different rooms each with a large counter surrounding an open-air kitchen shared between each room. It's actually a relatively small dining space and, were there tables, seating would be very limited. The atmosphere is dark with focused spot-lights, each illuminating the hanging charcuterie, the brightly colored vegetables, and of course, the food in front of diners. Like a workshop indeed, the halogen spots ensure that every detail of the intricately decorated food is highlighted, turning the food into art on display with each and every bite. I started my most recent visit with my favorite dish from the New York menu, La Châtaigne en velouté léger au fumet de céleri et lard fumé, a light chestnut velouté with smoked lardons, essence of celery, and a slab of seared foie gras. Aside from the shredded lettuce, which had no place in this dish other than for color variety, this was strikingly similar to La Châtaigne in New York, only with a more smoky flavor from the crisp bacon. I found the smokiness to be a little too strong, which distracted from the nuttiness of the soup and the richness of the foie. The texture was beautiful, the creamy velouté complementing the buttery foie gras, with the seared edges of the liver adding a crispy edge for textural differentiation. The consistency of the soup was kept thin for a velouté, which allowed for the foie to better stand out. The slightly foamed surface only heightened the texture of the velouté by increasing the viscosity without making the broth heavier. I still prefer the New York version due to its decreased smokiness; but, this was excellent. Next up was a second favorite from New York, L'Oeufde poule friand au caviar Osciètre d'Iran, a chicken egg topped with strips of phyllo dough, a dollop of osetra caviar, placed on top of a smoked salmon crème with garnishes of dill. With the first cut, the warm yolk oozed out moistening the phyllo and mixing beautifully with the crème to create a gamut of golden delight. The phyllo was a little oily; but this was forgotten once eaten in conjunction with the yolk and crème, two elements that cut down on the greasiness. The brine of the caviar also helped, adding an oceanic salt to this otherwise saltless dish. This dish was balanced in nearly every way, from the coolness of the caviar against the warm yolk, to the crunchy phyllo against the salmon crème. There were, however, three courses that didn't particularly interest me. The first was Le Crabe Royale aux fines tamalles de raves épicées, which was way too heavy on the crème making it seem like a picnic-style crab salad with mayonnaise. The sliced radish crown added a crisp and clean bite to the creamy crab salad; but this wasn't enough to remove the cold gummy mouthfeel. Aside from a single visible chunk of crab with red and white stripes, it was difficult to visually discern the exact components of the salad -- everything mixed together in sort of a white glop. I wouldn't get this dish again; it was the low point of my experiences here. A second disappointing dish, though a bit more interesting than the crab salad, was La Morue fraîche en imprimé d'herbes aux sucs de légumes et basilic, cod-fish with a vegetable extraction and fresh basil. My biggest problem with this dish was the gelatinous texture of the soup which absorbed the textures of the vegetables into a dull sappy potage. The consistency of the broth was also thick enough that it could not complement the fish's texture, thus adding no additional moisture. I did, however, like the thin strip of pasta hanging loosely over the fish as a second skin, locking in the moisture of the filet and adding a playful surface chew on the first bite. Last on the no-go list was something I actually sent back to the kitchen, a hard and lifeless rack of suckling pig, Le Cochon de Lait en côtelettes à la marjolaine avec jeunes oignons au jus. The texture of this meat was firm and dry, two things I did not expect to encounter. Perhaps if this was my first course for the night I wouldn't have sent it back; but, since it followed La Langoustine, my favorite dish of the evening, I was utterly disappointed. Aside from the delicious dollop of Joël Robuchon butter-mashed potatoes, which were mouthwateringly satisfying, the raw green vegetables were misplaced, creating too striking of a textural contrast. I would have liked to see some more young onion jus, and perhaps a more rare cut of meat next time. But the kitchen gladly took this back, and offered me a replacement, for which I chose a second tasting of La Langoustine, the luscious crustacean filled ravioli which, as of now, is my favorite dish in Paris. Alas, La Langoustine en ravioli truffé à l'étuvée de chou vert, two large langoustine tails enveloped in a thin strip of ravioli and sauced with a truffle crème. The juicy and soft texture of the langoustine melded with the resilient sheet of pasta, creating a chewiness that soon gave way to the rightfully undercooked shellfish center. The velvety crème filled every crevice of the lightly stringy langoustine, coating each bite with the earthy essence of truffle. 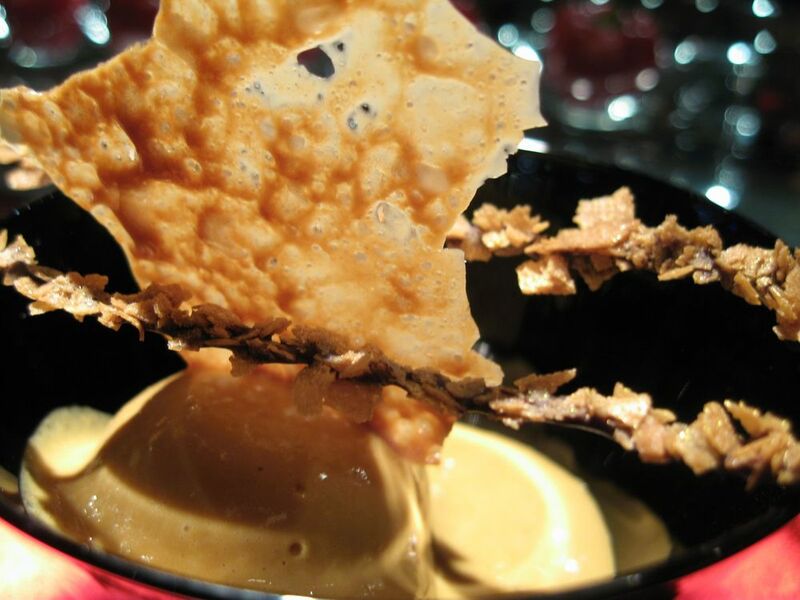 The truffle crème locked in the moisture of the ravioli, which in turn kept the langoustine moist and supple. This was a sensational dish, so much so, that I ordered a second in exchange for the lackluster suckling pig that followed it. Mmm. After seeing my ecstatic facial expressions from devouring tasting the ravioli, the waiter went to speak with the kitchen and came back with an off-menu surprise: potato gnocchi with black truffle shavings, parmesan, and radish leaves. Not sure where the radish leaves fit in here; but, this was a very pleasant follow-up to the langoustine ravioli. The mild flavor of the gnocchi made them the perfect vehicle for the earthy, aromatic truffles. The thin parmesan shavings added the salt for this dish, gently melting over the gnocchi while leaving the truffle in tact. The first time I visited L'Atelier Paris, I went with my mother and sister, two people who have very different tastes and preferences when it comes to food. Fortunately for me, however, it forced me to try dishes I would have otherwise never ordered. Take Les Spaghettis à notre façon, for example; a small bowl of spaghetti with a home made marinara sauce and whole olives. I never would have ordered this; but my sister, a pasta fanatic, put this as most desired dish for the evening. Another benefit of having a little sister is to take advantage of her little appetite, another socially acceptable excuse to try to get closer to the nirvana-like state that most call, being full. Les Spaghettis was fairly straight forward, though perhaps under-salted: a handful of spaghetti prepared the way god intendedal dente. Though not exactly a French dish, and perhaps the preparation was not so complex as some of the other items on the menu, this was a refreshing break from the heavy crème-laden sauces of French cuisine, albeit there was quite a bit of oil in the sauce. My mother also ordered something I would look past, La Sardine en filet, façon escabèche aux épices, small spiced sardines to be eaten, bones and all. These five whole fish were served with a side of an herbal mayonaise, reminiscent of summertime fried fish and tartar sauce. The saltiness of the small fish were tempered by the thick mayonaise. There was nothing out of the ordinary about this dish; but given the choice, I would have liked to see a preparation more exemplary of Joël Robuchon and his technique. This dish seemed very ordinary. To be truthful, I'm not sure why it was even on the menu. My mother also ordered Le Foie Gras frais de canard cuit au torchon, foie gras pâté briefly torched on the surface to add a smoky essence while preserving the natural foie flavor. This was served with toasted brioche, a vehicle for taming the buttery richness of the liver. This was a lot of liver; I couldn't believe it was served with a single brioche -- a ratio that implies a mound of foie should be applied to each fragment of bread. Unyielding to culinary pressure, I asked for 2 more slices so I could have some my mother would enjoy the textural contrast more. That being said, I did not like the flavor of this foie pâté -- the smokiness completely distracted from the flavor of the liver, as did the spiciness of the pepper sprinkled on top. Now for my course, which stole the show that evening, La Morille sur un lit de macaronis au foie gras, sot-l'y-laisse et jus de volaille, morel mushrooms, fowl, and foie gras seated on a bed of macaroni and sauced with fowl jus. Oh god. Well to begin, look at the incredible diversity of all-star ingredients combined in a very original way. Morels and foie gras? Mmm. Foie gras and fowl? Mmm. Fowl and morels? Mmm. Macaroni and fowl jus? I think it's clear that these ingredients just work wonderfully together, particularly with texture: the buttery foie against the firm fowl, the slightly crispy morels accentuating the al dente macaroni. The volaille jus was the only salted element on the plate, adding a creamy finish making every bite simply explode with flavor. And with all that, the presentation was beautiful. The last course that evening for me was Le Saint-Pierre en filet avec ses vévettes mitonnées aux piments doux et chorizo, whole scallops served with sweet pepper and chorizo. This dish was somewhat confusing as I could not tell whether it was a salad, in which case the chorizo and rationing of scallops seemed off, or if it was a more hearty dish, in which case the raw greens held it back. The scallops were also slightly overcooked, which left them dry and flavorless, particularly since there was no saucing. I found myself pushing the rocket to the side, as well as the chorizo, eating only the scallops. This was a little disappointing. The first time I visited L'Atelier my family requested to skip dessert, so I had to make up for it the second time with three. The first was Le Caramel glacé au Nougat et Poire fondante, caramel and nougat gelato with a black pepper fondante. The fondante, in particular, sounded interesting to me. Fortunately, the taste of pepper was unidentifiable; if it weren't for the menu telling me, I would have never guessed pepper. The texture of the gelato was slightly sticky so that as it began to melt, it held its shape. It wasn't very sweet, and a little more sugar would have gone a long way. The second of the three desserts was a new addition to the menu, Le Multivitaminé ganache au chocolat jivara, a Jivara chocolate ganache covered with verbena leaf crème and red fruits. Perhaps in French, multivitamin means high caloric intake; because I certainly could not see the nutritional value in this. This seemed more like a thick chocolate pudding, garnished with red and brown chocolate circles. The flavor was muted, not identifiably chocolate nor anything else for that matter. It left my palate disappointed, and my iron count low. And last, Le pot de crème vanille et chocolat, two pot de crème served with a chocolate biscuit, caramel mousse, and a thin caramel crown. The vanilla and chocolate pot de crèmes were pretty boring; both of which, like Le Multivitaminé, had muted flavors. These were also texturally boring with nothing to break up the monotony of the pudding consistency. The biscuit, on the other hand, was the best part of this dish, as it was more interesting. Sitting atop the slightly salty chocolate biscuit was a sweet vanilla crème, the flavors of which, when combined with the crispy caramel roof, left my mouth tingling. It was also pretty to look at, much more so than two opaque white cups. It was interesting for me to see how this "chain" would turn out in a different country, particularly when it comes to finding the balance between Joël Robuchon's international technique and the local culinary team's own style. Ultimately, there were two extreme highs, la langoustine and la morille and two excellent dishes, la châtaigne and l'oeuf, the rest fell slightly north of average. All of the desserts that I tried were disappointing. What was interesting was that all the dishes I felt were the strongest were listed on the tasting menu, suggesting that the restaurant is well-aware of its culinary strong points and the other dishes exist to please the wide array of diner palates, such as those of my mother and sister. I appreciate that very much, as finding the balance between a chef's vision and a diner's taste is an ever-going challenge in humility and creativity for any chef. I look forward to returning when the menu changes this spring.